The lighting system is one of the easiest things you can automate at home. As a matter of fact, you can automate the switching of the lights through the use of a wireless light switch such as a WiFi light switch or a smart light switch. A WiFi light switch is a wireless remote light switch which you can control remotely through the internet or a WiFi connection at home. With this, we’ll feature not only the best among these wireless light switches but also will help learn more about them. And, we have a guide about these smart switches you can use to build a smart home lighting control system. 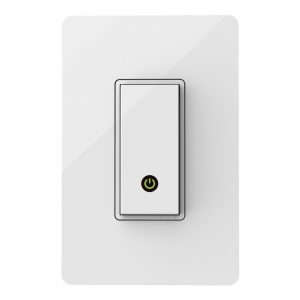 In this article, we’ll feature the best WiFi light switches you can find in the market today. What is a WiFi Light Switch? How To Choose The Best Wireless Light Switch? A WiFi light switch is a wireless switch which provides the users remote control through the use of the WiFi connection at home. Because of that, we can also call these devices as smart light switches. There are plenty of communication technology which can make a light switch into a smart device. Some of these technologies are WiFi , Bluetooth, Z-Wave and Zigbee. But in this post, we’ll focus on the WiFi enabled smart light switch. In addition, this smart device can help you manage and control your home lighting system with ease and comfort. Yes, wireless light switches can provide you with really nice and helpful benefits. And, these devices can really mean huge advantages for you. Normally, people are already comfortable with the usual manual switches to switch on or off the lights. But if you’ll experience using this smart switch, it should give you a glimpse of how helpful they can be. In fact, there are several benefits of using a wireless light switch instead of the usual manual switches we usually have. This smart device can ease up the way you turn on or off the lights through the capability of doing it anywhere. As long as you have an internet connection, you can pretty much turn it on or off remotely from anywhere you are. With this, this is one of the easiest and most convenient way for you to turn on or off any light at home. Knowing when your lights are on, you can save some energy by turning it off anywhere and anytime. You don’t need to be there physically to switch off the lights. All you need is to run the application in your smart phone and turn it off. You have the power to manage and control anytime the lights with your smart phone. For security, wireless smart switches can help provide safety and protection for your home. Imagine when you’re away from home on vacation or when no one’s at home at night. So, no one will turn on the lights. But with these smart switches, you can turn it on from where you are. Thus, it creates an impression that someone is at home. Furthermore, tt can also provide comfort in terms of being able to turn on or off the lights anywhere. While it can be painstaking and time-consuming, finding the right WiFi light switch for your for your home is very rewarding. From different choices, we hope that this list of the best WiFi light switches can help you in finding the right one for your needs. The bestseller in electrical light switches in Amazon, TP-Link Smart WiFi Light Switch lives up to its ranking with all of its features. This wireless light switch from TP-Link provides you wireless control with your switch through its free Kasa smartphone application. As long as you have internet, you can control lights or devices connected with the switch. The Kasa mobile application is compatible with Android 4.1 and up and iOS8 and above. And, TP-Link Smart Light Switch is also compatible with Amazon Alexa and Google Assistant. With this device, you will be able to control your lights from anywhere through your smart phone with its Kasa application. Not only that, you can also set schedules when to turn on or turn off the switch like during dawn or at night depending upon your own schedule. There is also an “Away Mode” in which the switch turns on or off the lights randomly to make it look like someone’s at home. This is definitely helpful when you’re away from home during vacations. These features indeed provide not just remote control over your switch and lights but also provide some security features. This wireless switch has LED indicator to help you find or locate it at night. The model of this smart switch is HS200 which supports IEEE 802.11 b/g/n protocol with a wireless type of 2.4 GHz 1T1R. It supports Android 4.1 and above & iOS 8 and above. It operates at temperature of 0 ºC ~ 40 ºC (32°F ~ 104°F) and humidity of 5%~90%RH, Non-condensing. The weight of this device is 133g and the dimension is 5 x 3.3 x 1.5 inches (H x W x D). It also features Power, Restart and Reset buttons. The input voltage is 100 – 120VAC, 50/60Hz and 15.0 A while the output voltage is 100 – 120VAC. It’s working maximum load is 15A, 600W Incandescent and maximum power of 3.68 KW. Download the TP-Link Kasa from App Store or Google Play store. Connect your mobile device to your 2.4GHz Wi-Fi network. Launch Kasa and follow the wiring steps provided. Connect the Smart Switch to your home network. This wifi light switch is from Belkin’s Wemo Home Automation. 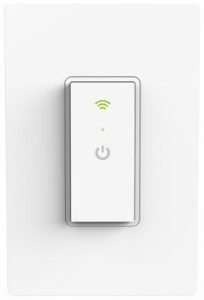 Like other smart switches, Belkin Wemo WiFi light switch connects to your existing wifi network connection at home to control your lights remotely. You just need to install this switch, download the WeMo app and then set them up. Yes, that’s it. There’s no need for any smart hub or whatsoever. It works by itself through its mobile application. You only need to install the free Wemo application to your smartphone. From there, you can control your lights from wherever you are. Not just that, you can also set schedules for your lights. Aside from its smart wireless features, it can also work as a normal light switch which you can push to turn on or off the lights. Simply, the Wemo WiFi light switch is a light switch which uses your WiFi internet connection to give you smart features. This is because it is a WiFi controlled electrical light switch. Aside from being a WiFi controlled light switch, this switch is also compatible with Amazon Alexa and NEST Learning Thermostat. However, the Alexa device is a separate device which you need to have. This pair can give you voice control over your light switch. It’s completely hands-free switching. Also, it will work fine with IFTTT. This light switch requires a neutral wire to install. Also, it is not recommended to have a metal faceplate because it may interfere with its connection to the WiFi network. The design of Wemo light switch considers modularity. It means, you can add another WeMo switch anytime to control other light or electrical devices at home. However, this switch only works with any one-way connection lights because it is not compatible with three-way connections. 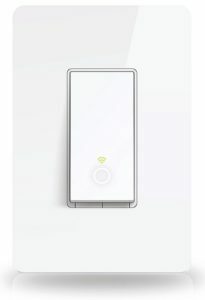 Leviton Decora Smart WiFi Switch is part of Leviton Decora Smart with WiFi Technology family of five products. The other devices are in-wall dimmers and plug-in modules which are for appliances, lamps and even LED and incandescent bulbs. As expected, this smart switch features the remote capability to control lights and other devices connected to the switch through the free My Leviton application. There is no need for a Hub for you to have this remote access to the switch from anywhere. You can also set schedules for your lights to turn on or off at specific configured times. It also features the ability to group smart devices into rooms and create scenes for you to activate several lights at the same time. All of these things are possible because this smart wireless switch uses your WiFi with your existing internet connection and with the My Leviton app. All you need to have is this device, a WiFi connection and a smartphone. Its free My Leviton application is available for Android and iOs devices. Through the app, you can add devices to your smart home. You can also create schedules for different times of the day or days in the week to automate when your switch turns on or off. This switch supports LED and CFL light bulb technologies of up to 600 Watts. 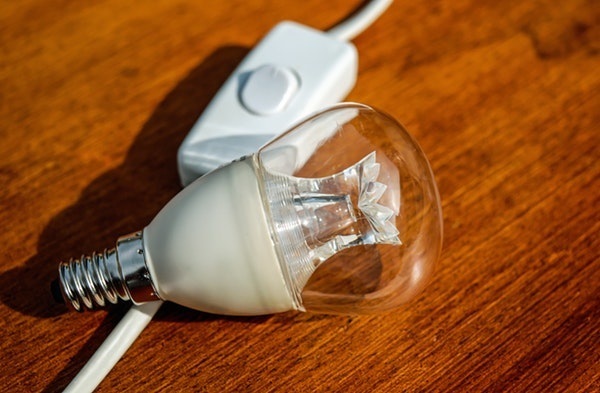 It also can support legacy incandescent bulbs of up to 1800 Watts as well as Fluorescent, Resistive and Motor loads. The design of Decora Smart devices is for countries which follows NEMA standards like US, Canada and among others. This switch is also compatible with Amazon Alexa voice control and Google Assistant voice control. Thus, you can pair this switch to an Alexa device like Echo, Dot and Tap as well as Google Home. This smart wireless switch comes in with white and light almond faces as part of the package. For multi-location switching (3-way), you can achieve this using DDOSR-1 coordinating remote but without LED indicator. You can also achieve it using DDOSR-DLZ matching remote which has a LED indicator. This is rated for LED and CFL loads of up to 600W, 5A with 120VAC, 60Hz. The standards and compliance for this device include UL 917, CSA Certified, NOM-ANCE Certified, Wi-Fi Certified and FCC Part 15, Class B. It has 5 year limited warranty. Compatible with Amazon Alexa and Google Assistant devices. WiOn products will turn your home into a smart home just using your existing wireless router without the need of any smart hub. 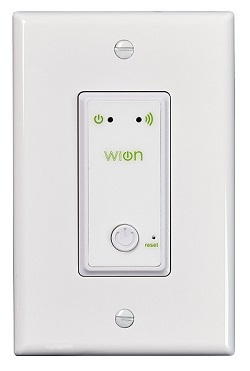 The WiOn Indoor Wifi Light Switch can provide you control over your electrical devices like a light bulb through the use of its free mobile application. It only needs to connect to your existing WiFi router so you can automate switching of an electrical device at home. Thus, there is no need for a smart hub or for any monthly fees to pay. It has a free application which works with smart phones running on iOS7 and up as well as Android 4.0 and up. Using the app, you can control of up to 12 connected devices. Through the app, you can schedule multiple on and off programs, random security schedules and even sunrise/sunset schedules. And, you can use this smart switch to automate control over electrical devices like ceiling fans and porch and overhead lighting. This wireless switch has ratings of 125VAC, 60Hz, 1000W Tungsten, 15A Resistive and ½ HP. You can replace your existing wall switch with this one. Although for installation, it requires a neutral wire and a 4-wire connection. Thus, it is recommended to have a licenses electrician to install this unless you know how to install one. And, the wall plate is not included. The next WiFi switch comes from Ankuoo. You can replace your existing manual switch with Ankuoo NEO WiFi switch which you can connect to your current home WiFi network. This WiFi light switch allows you to control your lights through their free NEO mobile application available for Android and iOS mobile devices.The mobile application can also be used to control multiple NEO switches in your home. Aside from that, multiple mobile devices within the same WiFi network connection can shared control for each NEO light switch. On the other hand, you can also set a light switch to invisible during setup to disable sharing of control with other mobile device. To gain wireless control of your switches, all you need are the switch, the WiFi network and the mobile application. After all setup and installation, you can now remotely turn on or off the lights at home through your smart switch. Aside from that, you can also set schedules when your switches turns on or off. It also features a countdown timer which allows you to set a specific time before the switch turns off. The Ankuoo NEO wifi switch also has an anti-theft feature which allows you to automate lighting control to pretend as if someone is at home. The NEO switch requires a neutral wire. It also only replaces single pole-switch and does not support metal faceplate. The switch features a wifi indicator and on/off indicator so you can see if status of the switch. This switch doesn’t work with Amazon Alexa. But, it only works with one-way connection and not on three-way connection. Also, the switch is also not compatible with single hot/load wire switches. A good WiFi light switch should provide you with enough smart features to control your lights remotely using a mobile application. These devices could provide you easy and simple implementation for home automation light switching. So, we hope that this guide could help you to find a good smart light switch. To point out, the biggest considerations in making this list of the best WiFi light switches are the number of buyers in Amazon, the reviews and the rating they have given. We also consider the features of the smart light switch. Hence, we advice that you should read the reviews because they will be helpful to you. You can always check them yourself to help you check if any of this WiFi light switches fits your lifestyle. In addition, one good consideration you should consider is if you wanted to automate the other operations at your home. If so, your light switch should have the feature to connect to an automation hub like Samsung SmartThings or Amazon Echo. With an entire home automation in mind, these hubs can be the brain of your automation system which will include your lighting system. However, we are talking about WiFi enabled light switch so we’ll focus on that. While having plenty of choices could make your decision difficult, it can also provide you enough choices to consider. But, how will you choose the best one among the list? Let’s talk about some factors you can check before you pick any of these WiFi light switch. First of all, you should consider what are you looking for in a smart light switch. If there are certain features aside from being able to control remotely the switch, list them down. Check every one of this light switch if any of these fits for the kind of smart switch you are looking for. Usually, the price of a product will always be a consideration. We all look for the best value we can get for the money we are to spend, right? Therefore, you also consider the prices of each of the choices you have an see which products is a good return for the money you will spend. Does it have the features you are looking for? Is the price within the range of what you are willing to pay for. As always, it is important that you read reviews of the product. The best place is to read reviews of the product in Amazon. Like you, these are users who are giving their honest review and experiences with the products. These reviews should provide you with useful data for you to decide which is good for you. So, never forget to read feedbacks from other users because they might have the same needs as you are. When you choose a smart switch, it is also a good habit to know the warranty of the device. How long will they be ready to fix any damages or replace it. And, will they give you support and answer if you have questions. Always look for the warranty information as well as the contact for the support of the device. There are several communication protocols which makes a device like a light switch into a smart switch. The use of existing and most common which is wifi is just one of these communication technologies. Some other communication protocols used in home automation includes Bluetooth, Z-Wave, Zigbee and among others. Sometimes, instead of giving more options to users like you, these can increase the difficulty in choosing which technology to use for your smart devices. Since this article is on using wifi connection, let’s differentiate wifi over the other communication technologies mentioned above. First, the best thing about using a wifi light switch is that you don’t need to have a smart hub. Yes, you only have to buy the switch and download the free mobile application for each brand. This could be an advantage because this is easier to setup and cheaper in a sense you don’t need to buy anything else. This works fine if you only want to automation lighting and some other light electrical devices at home. However, if you want to control more and different electrical devices like thermostats, sensors, garage door and many more, then you may want to consider using other technology like Z-Wave. They provide greater flexibility with using other smart devices. These wifi light switches provides you a fast and easy way to add smart features to your home. We know that almost everyone has a wifi internet connection at home. Also, almost everyone has smartphones. These makes these smart switches powered by wifi perfect to get started with home automation. They are easy to setup and install. Most of all, they will readily work fine with your existing wifi connection at home. Finally, there are lot of home automation systems out there. There are also plenty of communication protocol aside from wifi which make electrical devices such as light switches to become smart. 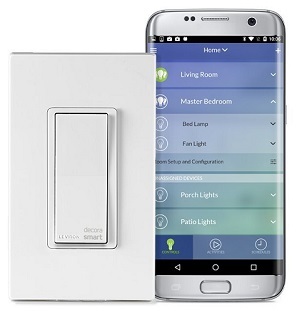 However, if you are just looking to automate your lighting system, you can start with this list of the best WiFi light switches currently available in the market.